We have been able to trace some of the occupants of the cottage that became number 1 Gloucester Road in the census, land tax and other records. In the 1840 Tithe Survey, the house was owned by Isaac Roberts who owned the whole terrace. The house thought to be number 1 was occupied by Ann Phillips. In the 1841 census, it was occupied by Ann who was a shopkeeper aged 48. She lived with Mary Phillips aged 46, and Elizabeth Phillips aged 40. None of them were born in Gloucestershire. In the 1839 Trade Directory Ann Phillips was described as a draper. Ann Phillips died on 21st October 1846 aged 61 years. We have not been able to find out any more about these three ladies. We have been told that Edward’s full name was Edward James Howell, a veterinary surgeon. Edward seems to have a mixed career. In the 1841 census he was listed as a school master when the family were living at Eastington. He was listed as a vet in the 1849, 1852 and 1856 Thornbury Trade Directories. His obituary in the Bath Chronicle also says that he was a veterinary surgeon. In the 1856 listing he was shown as living in St Mary Street. His death on 10th March 1856 was as a consequence of being a colt breaker as well as a farrier. His death certificate shows shows he suffered a fracture to his skull after being thrown from a colt at Old Down. In 1858 on 9th January there was a notice of the sale of the late Edward Howell’s premises. The owner of the property had been Mr J. H. Wyld who was now bankrupt. 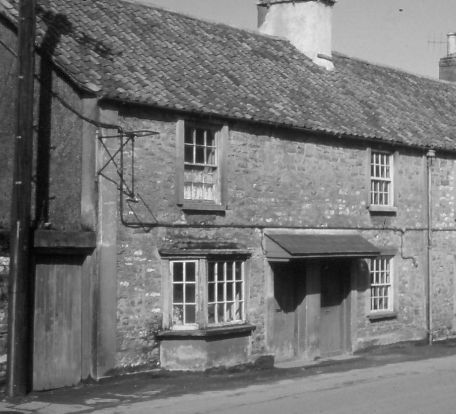 The notice describes the dwelling house, shop, yard and stable that Edward’s in Howell must have been using and says that the premises are now used by Edward Howell’s representatives at £8 per annum. Hannah – Hannah was baptised Anna Maria Howell on 28th April 1833 in Rodborough, Gloucestershire. Thornbury and District Museum has a letter written by Hannah which makes it clear that she travelled to Australia abut 1854 and the following year she married a boot and shoemaker called George Brooks. The couple lived in Adelaide. We believe that the marriage is recorded as Anna Maria Howell marrying George Brooks in Adelaide on 2nd October 1855. William Amos – By the Census of 1861, another widower, William Amos, had moved in. He was aged 33 and born in Bristol. William was a bootmaker employing three men, one of whom, William Garland, was lodging with William. William had five children: William Newton Treleven aged 13 and Clara aged 10, both born in Winterbourne, Lydia aged 7 born in Alveston, Henry G aged 3 and James H aged 2, both born in Thornbury. William’s wife Anna Maria died in October 1859 aged 30 years. William Amos appeared in 1868 as still trading in Colwell Street Road (Gloucester Road) although he seemed to have had major changes to his life in the 60s. By 1871, he had re-married, this time to Betsy Frost from Somerset, they had yet another child, a daughter, Clara Anna and moved to Hackney in London where William became a missionary at the Wood Street Mission House. In 1875, when William Newton Trevelen Amos married, he gave his address as Bedminster, Bristol. It was nice to see that after all this time away from Thornbury he still married a local girl, Eliza Wathen, the daughter of William Wathen, a brewer. Henry Williams – In 1871 the house was occupied by Henry Williams, a cordwainer aged 24 born in Thornbury. Henry was born in 1846, the son of James Williams, brush-maker of 62 High Street and his wife, Sarah (nee Stacey). Henry was the brother of Anna Maria Williams who married Walter William Pitcher – she and Walter were living opposite in the house now known as number 12 Gloucester Road. In the 1861 Census Henry aged 14 had started work as an errand boy. In 1871 Henry was living with his wife, Emma, aged 22 and children, Emily aged 3, Alice Maria aged 2 and Ernest Henry aged 1 month. 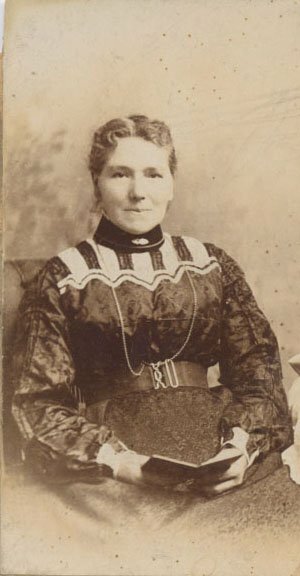 All the family were born in Thornbury, but Henry Williams and Emma Ball were married in Bristol on 14th January 1867. Emma (shown in the photo on the right) was baptised in 1848 as Charlotte Emma Ball, the daughter of Daniel Ball, a labourer and his wife, Eleanor. There were two lodgers living in the house with the Williams in 1871. They were Thomas Nelmes, another cordwainer aged 23 from Thornbury and Fanny Salmon, a widowed sick nurse aged 57 from Evercreech in Somerset. In 1876 the Rate Book shows that another tenant, John Vizard, had moved in so we assume that it was around this time that, Henry Williams moved to Pullins Green, Oldbury on Severn where he was living in the 1881 Census. Here he was employing James Buck, aged 17 as an apprentice in his cordwaining business. Henry’s family had grown considerably: he and Emma had added five more children: Sarah A. aged 8, Florence M. aged 6, Eleanor aged 4, Frederick aged 2 and Francis J. aged 10 months. There was no sign of Alice Maria in the household. The newspaper article shown on the left was printed in the Bristol Mercury on 8th September 1888. By 1891 Henry and his wife, now using her first name, Charlotte, were running the post office and a boot and shoemaking business. They had a son, Edwin Percy aged 5. By 1901, Henry was continuing the post office, but had become a farmer instead of shoemaking. The census of 1911 shows that Henry was still a farmer and Postmaster in Oldbury on Severn. Charlotte died in 1922, Henry in 1930. Both are buried at Oldbury. John Vizard – the Rate Book of 1876 shows that the tenant is John Vizard but at this time we do not know more about him. However it is likely that this is the John who had moved to 2 Bath Road by 1880. Read more about John Vizard of 2 Bath Road. William Harris – by 1880, the house was occupied by William Harris, and the 1881 Census shows that he was a general labourer, born in Thornbury and aged 47. He was living with Esther, his wife aged 42, their son, Joseph, aged 16 who was working as a blacksmith’s apprentice and two borders, Percy Hall aged 8 and Stanley Hall aged 7. Both the boarders were born in Thornbury. William had married Esther Ann Davis, the daughter of James Davis, a Thornbury shoemaker in January 1865. At the time of his marriage William was a soldier and was said to be the son of Joseph Harris, labourer. William and the family appear to have moved away for a short time. The 1885 Special Drainage District Rate Book clearly shows the tenant as William Batten and the 1887 Rate Book has the name of Walter Hooper clearly shown as the tenant for this house. The name is crossed through and replaced by William Harris. Normally this means that Walter Hooper has recently vacated the premises and replaced by William Harris. William Harris appears in the 1890 Voters List, qualifying for the vote through his occupation of the house in Gloucester Road. The 1891 Census shows that the house had just 4 rooms. These rooms were still occupied by William and Hester Harris. They had one lodger, Charles Lynham, a tailor aged 21 from Berrow in Somerset. The family seem to have moved elsewhere by 1893 as he does not appear in the Voters List for that year. The 1911 Census shows Hester, then a widow aged 72 living in one of the Staffords almshouses in St Mary Street. Hester died in Cheddar in 1919 aged 87. She was buried in Thornbury Cemetery under the name of Esther Ann on 22nd February 1919. Henry Allen – The next family which we have traced to the house is that of Henry Allen. This family was to remain in the house until it was demolished 65 years later. Click here to see more about the Allen family.